This is an In Person Signed C.D. Album Insert for 10 000 HZ Legend by Nicolas Godin and Jean-Benoit Dunckel. The C.D. is present and comes in its original plastic case. Air is a music duo from Versailles, France, consisting of Nicolas Godin and Jean-Benoit Dunckel. The name Air is derived from the backronym Amour, Imagination, Rêve which translates to Love, Imagination, Dream. 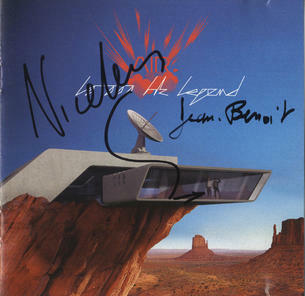 Air's debut EP, Premiers Symptômes, was followed by the critically acclaimed album Moon Safari, the re-release of Premiers Symptômes, The Virgin Suicides score, and subsequently albums 10 000 Hz Legend, Everybody Hertz, Talkie Walkie, Pocket Symphony, Love 2, and Le Voyage Dans La Lune.